Honey bees are amazing insects and have amazing and interesting little bodies. 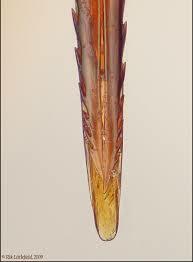 There are six main parts of the honey bee’s anatomy (her body) that I’m going to cover here. They are easy to remember if you count from one to six. One Stinger: Honey bees have one STINGER and can only sting one time, and then they die. Unlike other stinging insects (such as wasps) that have smoother stingers, the honey bees stinger has tiny barbs that are like hooks and get caught in what they are stinging. The bee tries to pull her stinger out but those barbs won’t budge and instead her stinger, a poison sack, and some of her intestines are ripped from her body. She cannot live without these so she flies off and dies. The little poison sac attached to the stinger will continue to pump venom until the stinger is removed Watch THIS video to see what happens when a bee stings. 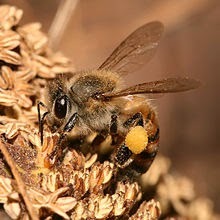 Two Pollen Baskets: The worker bees have two POLLEN BASKETS located on their back legs. These baskets are similar to the pockets you may have in your jeans, but on the bees they are made up of tiny hairs. Their body gets covered in pollen while they’re on flowers and they use special combs on their front legs to brush the pollen from their body into the pollen baskets. Then they bring that pollen back to their beehive where the bees will use it for food. has mandibles which are part of her mouth. She uses her mandibles to chew. The worker bees also have special glands inside their head that make food for the baby bees. The THORAX is where the wings attach to, and her ABDOMEN is where her digestive tract (stomach), heart, and stinger are. There are also wax glands on the bottom of her abdomen that make tiny flakes of beeswax. Four Wings: Honey bees can use their WINGS to fly about 15-20 miles per hour and their wings flap over 200 times per second! Sometimes it looks like they only have two wings and that is because they hook their wings together when they are in flight. Bees also use their wings to cool the hive down when it gets hot in the summertime by fanning and beating their wings very fast. 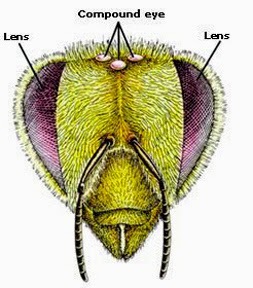 Five Eyes: Honey bees have two large compound EYES on either side of their head, and three tiny eyes on the top of their head. The honey bee’s two compound eyes are special because they allow her to see different colors and markings on flowers that we cannot see. They can also see ultra violet light, which we cannot see. A flower that looks white to us may actually look blue-green to a bee! The three eyes on top of the bees head are used to help her see in the dark, because it’s dark inside the beehive. 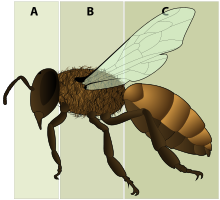 Six Legs: Having six LEGS make honey bees insects! Did you know that honey bees are actually the only insects that make food for humans? That food is honey of course! On her front pair of legs she has combs which she uses to brush the hair on her body, and remember, on her back set of legs she has two pollen baskets. Honey bees are also able to walk on many different kinds of surfaces because they have little hooks on their feet to grip rough surfaces, and pads that help them walk on smooth surfaces like glass. Have you ever heard the expression “it’s the bees knees”? Well, guess what, bees DO have knees! Next time you see a honey bee, count to six and see if you can remember these six things about her anatomy!